Nowadays, brands have the ability to reach consumers through a variety of channels and touchpoints. While this is good for marketing initiatives, brands can actually end up frustrating consumers if they don’t offer a consistent experience across channels. In fact, a recent global Zendesk study reveals that 73 percent of consumers think companies are paying more attention to generating sales across channels than they are in delivering a consistent customer experience. The study’s data suggests that consumers have pretty high standards when it comes to what they expect from an omnichannel customer service experience. 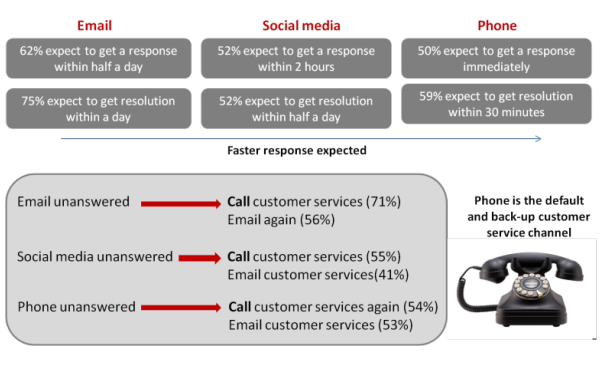 For example, 37 percent of the respondents said they increasingly expect to be able to contact the same customer service representative regardless of the channel they use, while 47 percent expect to be able to return items through a different channel than the one they purchased from. Unfortunately, just 7 percent of the survey respondents claim to be extremely satisfied with the omnichannel customer service experience they’ve received. Because of poor service, many consumers are turning to phone support when they need assistance. For instance, 71 percent of consumers will use the phone if an email is left unanswered, while 55 percent of consumers will do the same if a social media request isn’t answered. If the phone is also unanswered, 54 percent admit to calling back a second time. Moreover, 54 percent of consumers use the phone as their first point of contact for support, due to the perception that it has the quickest response time. Other data from the study sheds light on omnichannel shopping trends throughout the globe, revealing that U.S. consumers are actually the least likely to use multiple channels for a purchase. In fact, just 51 percent of Americans reported using multiple channels when making a purchase in the last six months, which is significantly lower than the worldwide average of 67 percent. Conversely, 86 percent of Brazilian consumers admit to using multiple channels when making a purchase. That said, rewards programs and reputation rank higher for U.S. consumers than shoppers in other countries, with 71 percent of Americans believing that being rewarded for purchases, feedback and referrals is important, compared to the global average of 66 percent. It is also important to note that 84 percent of U.S. shoppers consider a company’s reputation for customer service as being important, compared to 78 percent of consumers worldwide.